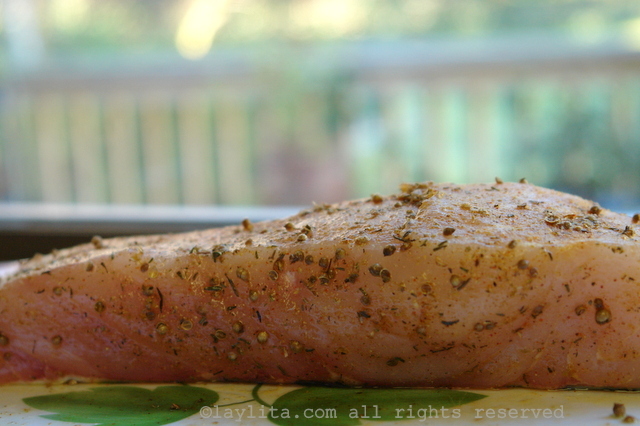 This is a very simple and flavorful recipe for grilled sturgeon. I had sturgeon for the first time a few years ago, on the grill at a friend’s house, and loved it. It has an almost steak like texture and more flavor than other types of fish. However, I could never find sturgeon at the grocery store or even at the fish market, so it started to become a distant memory. Then I was at Whole Foods recently, and wasn’t planning on buying fish, but the moment I saw the “Wild sturgeon” sign I knew we would be having fish for lunch that day. The seafood expert at Whole Foods mentioned that they only sell wild sturgeon, but it isn’t available very frequently. I mentioned that I was thinking of grilling the sturgeon and he recommended finishing it off in the oven because it tends to be tougher than most fish. I wanted the fish to have a lot of spicy flavor and used a coriander seasoning to marinate and season the fish. I used an electric indoor grill, partly because it is extremely cold outside and we have a charcoal grill that takes forever to warm up – but also because the electric grill is great for cooking fish in a precise way. 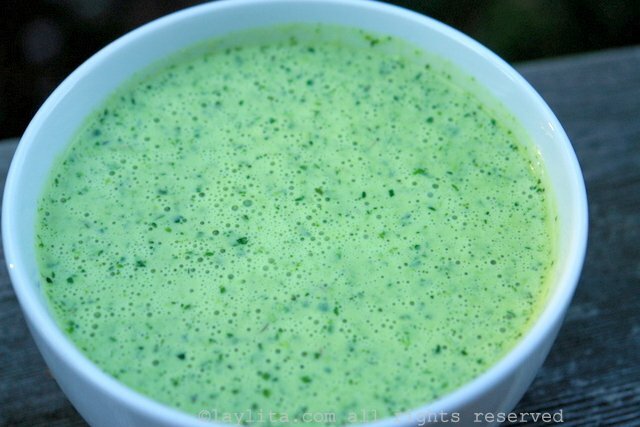 I love making sauces to serve with fish and seafood, and found a great recipe for a lime cilantro butter sauce in one of my favorite cookbooks Fired Up by Jeff Blank – owner/chef of Hudson’s on the Bend (an restaurant in Austin, TX). Grilled and baked wild sturgeon fish marinated with a spicy coriander seasoning and topped with a warm lime cilantro butter sauce. Place the sturgeon and the salt in a bowl and cover with water, let sit for about 10 minutes and rinse. To make the seasoning mix, put all the ingredients for the mix in a mini food processor and pulse until crushed and mixed. 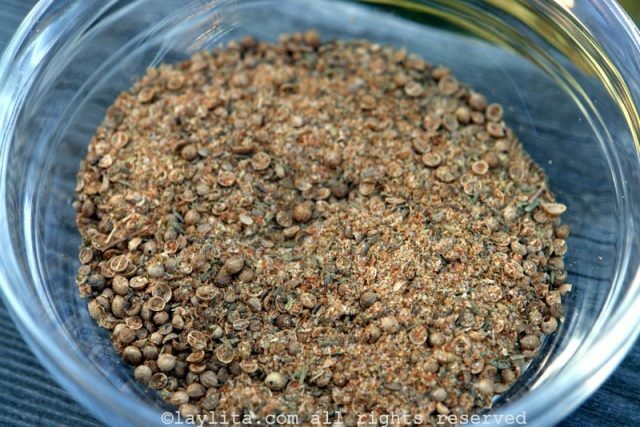 The coriander seeds will not be completely powdered and should be partially crushed. You can also use a mortar and pestle instead of the mini food processor. Rub the olive oil and spicy coriander seasoning all over the fish and let marinate in the refrigerator for a couple of hours. Heat the grill and place the sturgeon on the grill, grill for about 5 minutes per side. Transfer to oven safe dish and bake for about 15-20 minutes. Excellent recipe. We seared fish on the bbq and then pushed to side off direct heat, wrapped loosely in foil. No need to heat up the oven if you don’t want to. Spicy coriander tub is a keeper! Other sites mentioned this as the most challenging fish to make? I don’t understand… the recipe on this website couldn’t be simpler… came out amazing! I made this tonight and it was incredible. I only let it marinate for 30 minutes and that seemed to be fine. The fish was perfect and the sauce was delicious! Thank you so much! 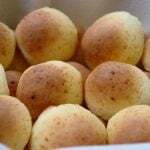 I just did this recipe tonight and loved it. I didn’t have fresh cilantro (only in a tube), nor cream (used 2% milk), nor green chiles (used dried red chiles), but it made little difference. The only thing I would do differently is I had a half a sturgeon (about 6lbs) and I rubbed some olive oil on the skin before I grilled it and it caught fire on the grill! Must be a bunch of nature oil in the sturgeon. The up side is that the smoky flavor was great and I ate the mostly charred skin. Mmmmmm…will do again. I didn’t make the sauce, which looks great, but the sturgeon was awesome. I just used some barbecue rub I always have on hand instead of the coriander seasoning. I also had never had sturgeon before but will definitely be on the lookout for it whenever I’m at the fish counter. Our neighbor gave us a big hunk of sturgeon and I had no idea what to do with it. We’ve never had it before so I didn’t know what to expect. 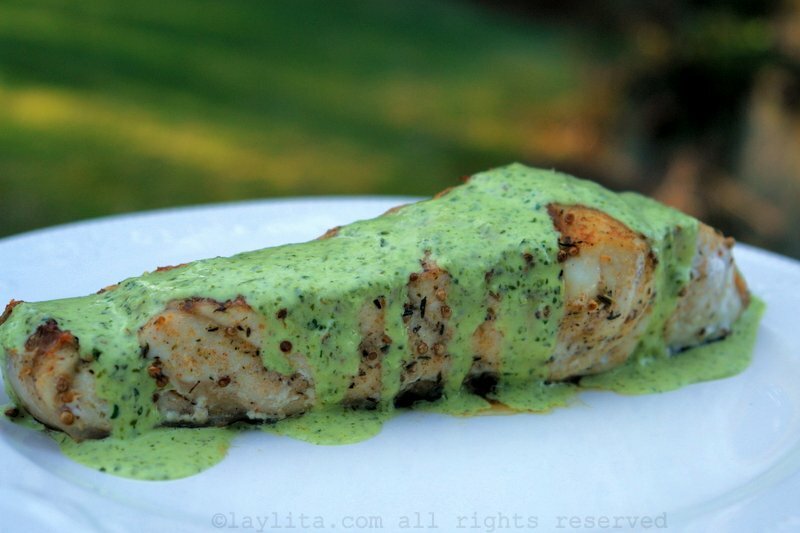 I busted out this grilled sturgeon with cilantro lime sauce and my husband and I both loved it. And I’m not a big fish eater. The sauce was awesome and husband commented that if he got this at a restaurant he’d be stoked. Thanks for the recipe. Five stars! 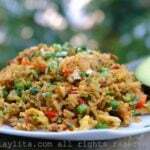 Hi Denise – I’m glad that both you and your husband enjoyed this dish! 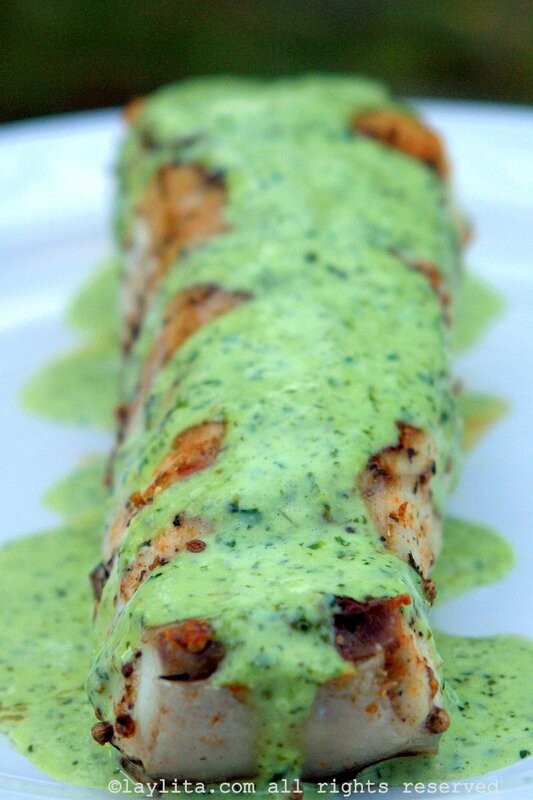 We tried the Sturgeon with coriander and lime chili/cilantro sauce and just loved it! Easy enough to put together and a wonderful addition to flavor this great fish! We had many hungry people and everyone wowed it!! Will try the lime chili/cilantro sauce on other fish!